The opening salvo in the battle for Women's Rights was fired in 1848 by the grande dame of U.S. feminism, Elizabeth Cady Stanton. When Stanton and colleague Lucretia Mott organized the nation's first women's rights convention in 1848, in Seneca Falls, New York, they sought nothing less than a revolution. They pressed for equal education, better employment opportunities, and the vote for women—radical notions in the mid–nineteenth-century United States. For fifty years, Stanton was a key strategist and standard-bearer for the feminist movement. Along with fellow suffragist susan b. anthony and other activists, she helped elevate the legal, social, and political status of U.S. women. "The Bible and the Church have been the greatest stumbling blocks in the wayofwomen's emancipation." Stanton was born November 12, 1815, in Johnstown, New York. She was the middle daughter of Daniel Cady and Margaret Livingston Cady, a prominent couple in Johnstown. Elizabeth was one of eleven children, but all five of her brothers and one sister died during childhood. In some ways, Stanton was raised by her parents as a substitute for those deceased brothers. Unlike most girls of her generation, Stanton participated in athletic activities and excelled in courses typically reserved for males, such as Latin, Greek, logic, philosophy, and economics. Stanton's father, a lawyer and a New York Supreme Court judge, even encouraged her to study law with him, although later he regretted his actions: as an adult, Stanton used her legal knowledge to craft well-reasoned arguments for women's rights, a cause he disliked. After she graduated from Johnstown Academy in 1830 at age fifteen, Stanton's ambition was to attend New York's Union College. Her enrollment was impossible, however, because Union, like every other college in the entire nation, did not admit women as students. (Ohio's Oberlin College was the first U.S. college to accept female students, in 1834.) Instead of Union College, Stanton attended Troy Female Seminary, in Troy, New York. She graduated in 1833. Stanton returned to Johnstown, where she divided her time between the pleasant diversions of upper-class life and the important social causes of the day. Despite her parents' objections, she married an abolitionist, Henry Brewster Stanton, in 1840. From the beginning of their marriage, Stanton insisted on being addressed in public by her full name. Throughout her long life, only her political enemies called her Mrs. Henry Stanton. While attending an international antislavery conference in London with her new husband in 1840, Stanton met Mott, a Quaker activist involved in the nascent U.S. women's movement. Stanton and Mott became quick friends and allies. Both were outraged over the refusal of the male antislavery leaders to seat female delegates at the London conference. Back in the United States, the two corresponded and sometimes joined forces in abolitionist activities. They also finalized plans for the nation's first women's rights convention. In 1848, one hundred women and men gathered in Seneca Falls for the historic convention. The agenda included a speech by renowned African American abolitionist Frederick Douglass, and a proposal to adopt Stanton's manifesto, the Declaration of Rights and Sentiments. The Seneca Falls declaration was inspired by the U.S. Declaration of Independence. It boldly proclaimed that all men and women were equal and that women deserved greater protection under the law. The declaration called for the expansion of employment and educational opportunities for women, and the right for women to vote. After lengthy debate, it was adopted in its entirety by the convention. The Seneca Falls Convention was derided by the press—prompting Stanton to complain that its participants "were neither sour old maids, childless women, nor divorced wives as the newspapers declared them to be." Nevertheless, the convention succeeded in bringing women's issues to the political forefront. After Seneca Falls, Stanton was an acknowledged leader of the U.S. women's movement. She soon joined forces with Anthony, the country's most prominent suffragist. For the next fifty years, Anthony was Stanton's staunchest feminist ally. In addition to women's rights and Abolition, Stanton was involved in temperance, the movement to ban the sale and consumption of alcohol in the United States. Combining temperance with women's rights made sense to Stanton, both philosophically and practically. Drunken men destroyed the lives of powerless wives and children. Without laws to protect them, women who were married to chronic drinkers often faced physical abuse and financial ruin. The Married Women's Property Act of 1848 addressed this imbalance in legal power. Stanton helped win passage of the law by conducting an exhaustive petition drive throughout the state of New York. Although Stanton supported temperance wholeheartedly, she was angered that the movement's male leaders were just as misguided as the abolitionists at the London antislavery conference. When Stanton attempted to participate in a Sons of Temperance meeting, she was summarily removed from the building. She and Anthony formed their own group, the Woman's State Temperance Society, in 1852. The women's movement stalled around the time of the U.S. Civil War because many of its supporters focused exclusively on abolition. As president of the National Woman's Loyal League, Stanton helped gather four hundred thousand signatures on petitions in support of the Thirteenth Amendment abolishing Slavery. After the war, Stanton and Anthony were bitterly disappointed when their abolitionist colleagues refused to support the inclusion of women in either the Fourteenth Amendment, which granted African American males citizenship, or the Fifteenth Amendment, which gave those males the right to vote. Stanton and Anthony formed the National Woman's Suffrage Association in 1869 with the sole purpose of winning the vote for women.Because Stanton was busy with her family of seven children, she initially worked at her home on voting rights strategy while Anthony traveled the country delivering lectures. Later, this arrangement changed as Stanton became a sought-after speaker during the 1870s in the lyceum movement, a series of cultural and educational programs for adults. As Stanton grew older, she became even more radical in her thinking. She shocked people with her pro-divorce, pro-labor, and antireligion opinions. In particular, her book Woman's Bible, published partially in 1895 and partially in 1898, drew fire because in it, Stanton lambasted what she viewed as the male bias of the Bible. When Stanton suggested that all organized religion oppressed women and should therefore be abolished, many felt she had gone too far. These unpopular opinions explain why some feminists disassociated themselves from Stanton and looked exclusively to Anthony for leadership. 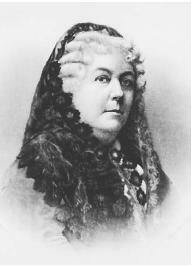 Stanton also helped compile three of the six volumes of the less controversial History of Woman Suffrage, published from 1881 to 1886, with coauthor Matilda Joslyn Gage. On Stanton's eightieth birthday, she was honored at a gala in New York City's Metropolitan Opera House. Looking back at her life, she told a crowd of six thousand people that she had been warned repeatedly against organizing the Seneca Falls convention. People told her it was a huge mistake because God had set the bounds of a woman's world and she should be satisfied with it. Stanton remarked that it was exactly this type of repressive attitude that led to her embrace of the women's movement. Stanton died October 26, 1902, in New York City, at the age of eighty-six. Although she did not witness the passage of the Nineteenth Amendment, which gave nearly 25 million U.S. women the right to vote in 1920, she left her imprint on it. Griffith, Elisabeth. 1984. In Her Own Right: The Life of Elizabeth Cady Stanton. New York: Oxford Univ. Press. Stanton, Elizabeth Cady. 1898. Eighty Years and More: Reminiscences, 1815–1897. Reprint, 2002. Amherst, N.Y.: Humanity Books. Wellman, Judith. 2004. The Road to Seneca Falls: Elizabeth Cady Stanton and the First Woman's Rights Convention. Urbana: Univ. of Illinois Press.